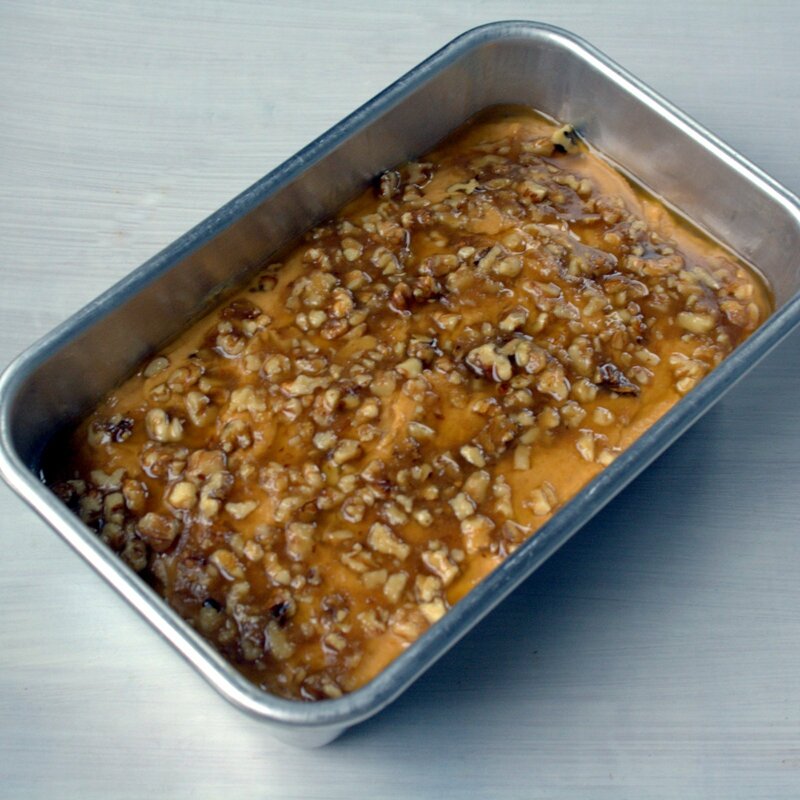 This bread is moist, delicious and with a sweet, nutty praline topping is totally amazing! 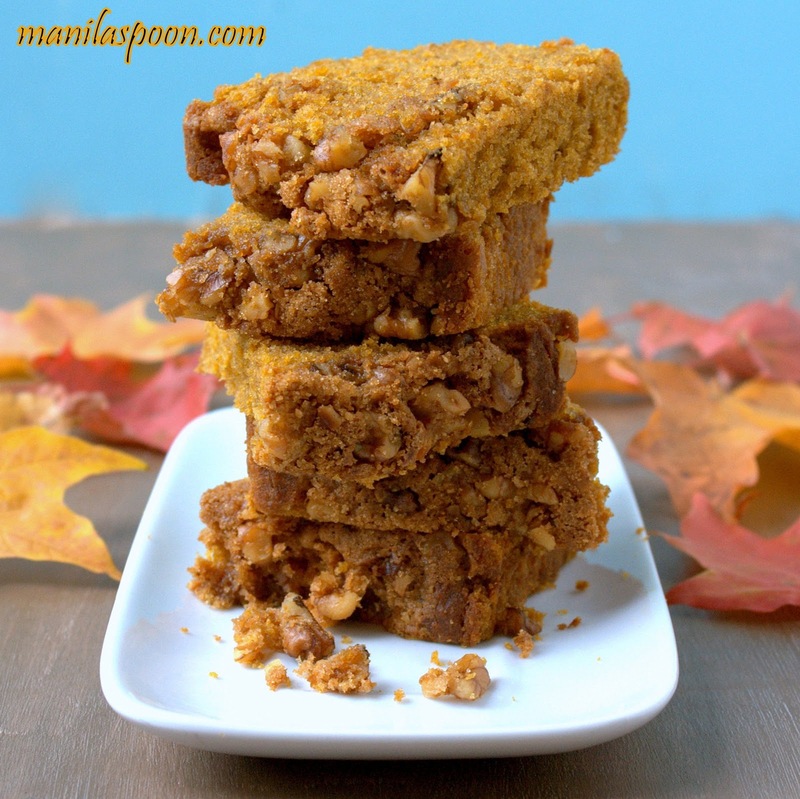 Fall-perfect – Pumpkin Praline Bread! Inspired by my Apple Praline Bread, I thought I’d make a pumpkin version of it. After all it’s Fall season which means Pumpkin time, too. I also wanted to try a new pumpkin bread recipe. I wasn’t sure it was going to work out the first time I made it but I was pleasantly surprised that it came out well. It was moist and delicious. It was so good that I probably ate half of the loaf (since my hubby is on a grain-free diet and cannot have it – which is not really good for my waist!) while the rest were eaten by the tots. For this first attempt, I added the nuts only to the Praline topping but, next time, I think I’ll add some to the batter as well for that extra crunch in every bite. 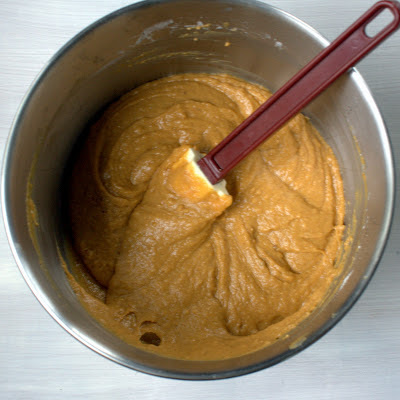 If you fancy making some pumpkin bread, why not try this one for a change? Have a lovely Fall! Lightly grease a large loaf pan. You can line it with parchment paper for easier removal. Mix all Praline Topping ingredients until crumbly. Set aside. Combine all the dry ingredients in a bowl. Whisk together to mix. Set aside. Place all the wet ingredients, including the brown and white sugar, in a mixing bowl. Mix together well. Usually, I lightly beat the eggs first and then add the rest. Fold in the dry ingredients into the wet one. Make sure that everything is well-incorporated and no flour spots appear. Fold in the nuts (if using). Pour the batter into the prepared loaf pan. I suggest using a light colored loaf pan so the bread does not get too dark. Sprinkle the praline topping onto the batter. Distribute the topping as evenly as you can. Bake for 50 – 60 minutes or until a toothpick inserted into center of the loaf comes out with only a few crumbs clinging to it. 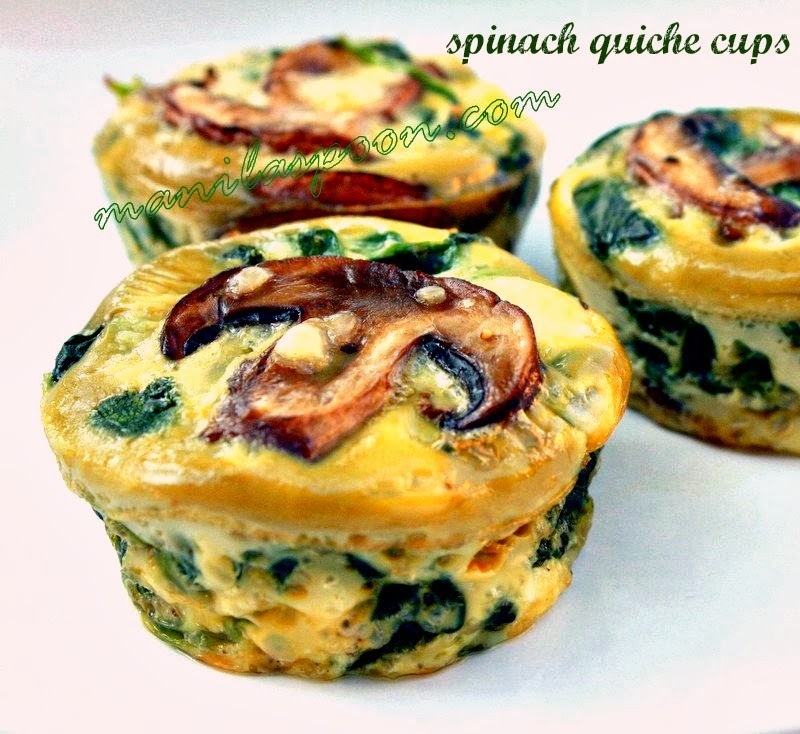 Cool in the pan for about 15 minutes then remove it by lifting the parchment paper. Transfer to a wire rack and cool completely before slicing. This will ensure the bread will not break apart. Are you able to get canned pumpkin in England? Last time I was there I had to bring one over from the US. Wondering, if the canned ones are available there now. Thanks for stopping by! This looks amazing! Love your photos and the idea of taking that delicious apple bread and changing it to pumpkin. My favorite taste for fall! Thanks for sharing on Foodie Friends Friday! Don't forget to come back and vote on Sunday! Thanks, Lois. Glad that the Apple recipe worked well for the Pumpkin! Have a great weekend! Hi Lisa! Oh, am so happy that you discovered Manila Spoon and took the time to drop by. Will go and visit your blog too! this looks and sounds amazing! Thanks for sharing with us at Foodie Friends Friday. Dawn a host and fellow blogger. I love pumpkin and pralines! Hi Dawn, thanks for stopping by! I always look forward to Fridays because of FFF! Appreciate your sweet compliment! Great recipe. Love the idea of putting nuts on my next batch of pumpkin bread!! The nuts add more flavor and texture to the bread! Thanks for stopping by Emily! Thanks for the invite Kathy! Nice of you stop by! My husband does not like pumpkin but loves sweet potatoes which makes no sense to me because they taste so much alike to me. Can I substitute? You can certainly try it Sharon. I haven't done so myself but I cannot see why not. Am sure it would be wonderful, too. Thanks for stopping by. Pumpkin bread is a staple in my house in the fall and this one is a must-try! It looks so moist and perfect with that praline topping!